MILWAUKEE, Wis. — Brady (NYSE:BRC), a global leader in industrial and safety printing systems and solutions, today announced it earned the Environmental Protection 2014 New Product of the Year Award. The company won first place recognition in the Health & Safety/Cleanup category with its High Visibility Safety and Chemical Absorbent Mat. 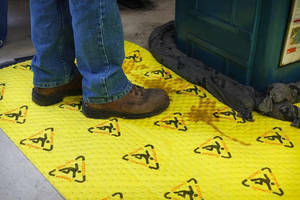 This highly absorbent safety mat is specifically designed for all-purpose industrial applications. Featuring bright yellow caution coloring and a printed message, this product visually warns workers of potential risks. With its three-ply SMM construction (spunbond coverstock and two layers of meltblown polypropylene) the mat provides a versatile combination of high durability, excellent absorbency and low linting. "Having our High Visibility Safety and Chemical Absorbent Mat recognized as the Environmental Protection New Product of the Year is something to truly be proud of," says Courtney Bohman, product marketing specialist at Brady. "This honor is a testament to the hard work and innovation of our Brady SPC team. By combining safety signage with ultimate absorbency, our mat solves common industry challenges to help reduce workplace slips, trips and falls." The Environmental Protection New Product of the Year contest recognizes the outstanding achievements of industry manufacturers whose products are considered particularly noteworthy for making environmental professionals' jobs a little easier. Three experts from the environmental industry served as judges. "We heartily congratulate all of the companies that entered the contest, particularly the many entrants in the Health and Safety/Cleanup category," says Jerry Laws, editorial director of eponline.com. "The judges' scores in every category were extremely close, which testifies to the quality and innovation in each product that was entered this year." To learn more about Brady's absorbent products, visit BradyID.com/SPC. For Brady's complete product offering, visit BradyID.com. Brady Corporation is an international manufacturer and marketer of complete solutions that identify and protect people, products and places. Brady's products help customers increase safety, security, productivity and performance and include high-performance labels, signs, safety devices, printing systems and software. Founded in 1914, the company has a diverse customer base in electronics, telecommunications, manufacturing, electrical, construction, education, medical, aerospace and a variety of other industries. Brady is headquartered in Milwaukee, Wisconsin and as of August 1, 2014, employed approximately 6,400 people in its worldwide businesses. Brady's fiscal 2014 sales were approximately $1.23 billion. Brady stock trades on the New York Stock Exchange under the symbol BRC. More information is available on the Internet at www.bradycorp.com.